Appears to be possibly the blue level 80 pvp set. Would assume that it's for warriors by the name "savage", which is the name of the level 70 set for them. Edit : Or it's a level 80 crafted set, didn't see that originally. Possibly good for all plate classes. Edit 2 : After getting full information on the cost of the new PvP gear, this will most likely be the main gear worn by melee plate classes. New PvP Blue set requires Arena Points, making this set a lot easier to attain. It has no sockets, tho these might be added through Blacksmithing as well. The set is entirely BoE and heavy on metal but low on primals. The materials for each item ranges from 20-25 Saronite Bar's and one primal, with the exception of the bracers which require 16 Saronite Bar's. 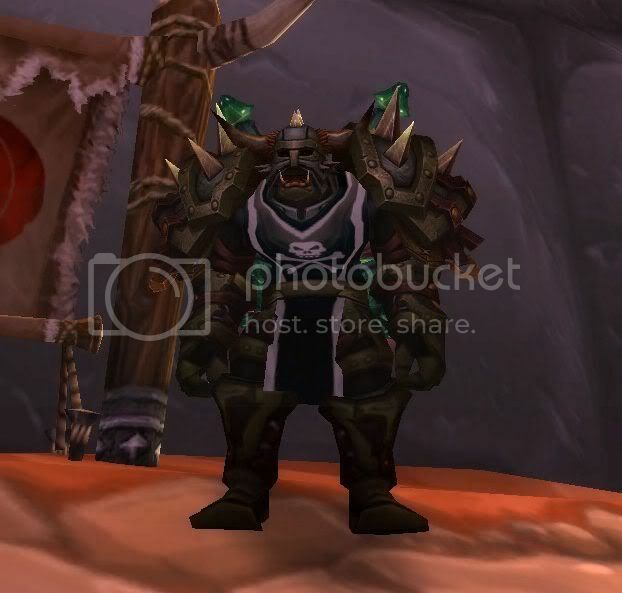 Looks like it could be a good starting PVP set for all plate classes. Easy to obtain as you can simply buy it from the auction house. A very nice set for starting the arena season, or just some bg fun! getting instagibbed without ressi in pve gear isnt that fun. A material listing for the full 8/8 Savage Saronite set. This is a great set for DPS DKs, PvP or PvE. Especially Frost. Don't think it's limited to Battlegrounds and pass it up.